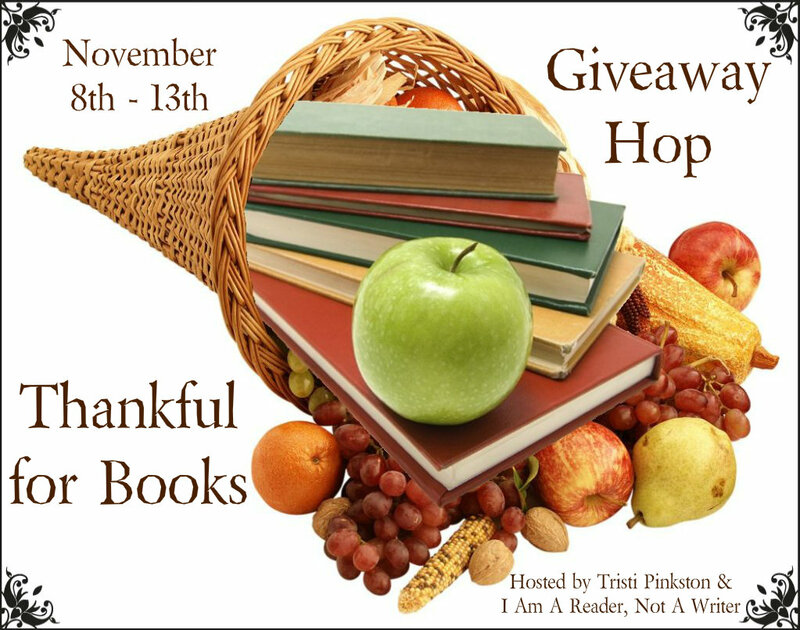 Welcome to my stop on the Thankful for Books Giveaway Hop! I'm giving away a $10 Amazon gift card...get a head start on your Christmas shopping, or treat yourself to something special! Simply leave a comment with your email address so I can contact you...and if you choose to follow my blog I'll enter you in my giveaway twice. Good luck and have fun!!! So glad you are part of the hop! Thank you for being a part of the hop and for the amazing gift. I followed you through Twitter (spoildbrat31) and GFC (Scott Wilcox). Thank you for the giveaway! I look forward to receiving your emails. Awesome giveaway - thank you!! I follow your GFC, and just finished reading the same book as you! Great giveaway! Thanks for the chance. I follow via GFC. New GFC follower :) thanks for a great giveaway opportunity! Thank you so much for taking part in the hop and for the awesome giveaway! Your cat below is adorable!! This is a great giveaway. It is so hard to come up with family gift money these days. Thanks for the simple giveaway! New GFC follower as Abby! I am #400!! Congrats! I am thankful for all these great blogs that are participating in the hop and all the chances to win books that I can't afford to buy now. Thanks so much for being part of the hop. I am already a GFC follower as Lisa Walker. Thanks for the chance! Thanks for the contest! This would help me get a headstart on Christmas shopping! I follow on GFC as ParentingAuthor. Thank you! Thank you for having the giveaway! Amazon is a dangerous place this time of year . . . although I did get lucky, I found a really cute necklace for $1.10 with free shipping, so my sister and I get matching necklaces this year ;). Thanks for being on the hop! Lots to be thankful about. Love Amazon gift cards! They are always the best! Thank you for the giveaway! I followed thru gfc-thanks for the giveaway! Love Amazon, you can find anything there! Thanks so much for hosting this great giveaway! Hi I follow your your blog by email and my email is gothiclvr18@gmail.com You read the same type of books that I do. Thanks for being in the blog hop! I'm definitely thankful for books. Thank you for the great giveaway & I hope you have a great day! I love reading so I will probably keep the GC to buy myself some new books. I'm so thankful for these great blog hops, they sure help me with my book addiction. :) Thank you. Hope you are hainvg an amazing weekend.Thank you for the chance to win. I follow by GFC and by email. Great giveaway! I'm a new GFC follower: Barbara E.
thank you for the giveaway! wilsondev(at)gmail(dot)com. I'm a gfc follower! I love the pics of the cat :) mine is the same coloring but more black. Thanks for the giveaway. Interesting blog! Thanks for participating in th ehop and the giveaway you are offering. Thanks for the great giveaway and I love those kitties too. Following via GFC as Kim Reid, Thank you! I agree with your best things of life, except I have to add my son, chocolate and books:) We have a new kitty, somebody dropped him off:(, so we adopted Ernie( his name from my 3 year old..." Mommy he is orange so name him Ernie")Thank you for being a part of this hop! Happy Holidays! Thank you for the wonderful hop! Thank you for the great giveaway and fun blog hop! Thanks for a great giveaway, i love amazon! Thanks for the chance at this great giveaway!! Thanks for being part of this blog hop/giveaway!